Cruise to the island paradise of Capri, explore Roman greats like Vatican City, take a culinary lesson from a Florentine chef, discover the stunning Cinque Terre and try carnival mask making in Venice. Arrive in Naples and transfer to your hotel. Gather with your fellow guests at tonight’s welcome dinner. Take a walking tour through elegant Sorrento and travel the breathtaking Amalfi Coast. 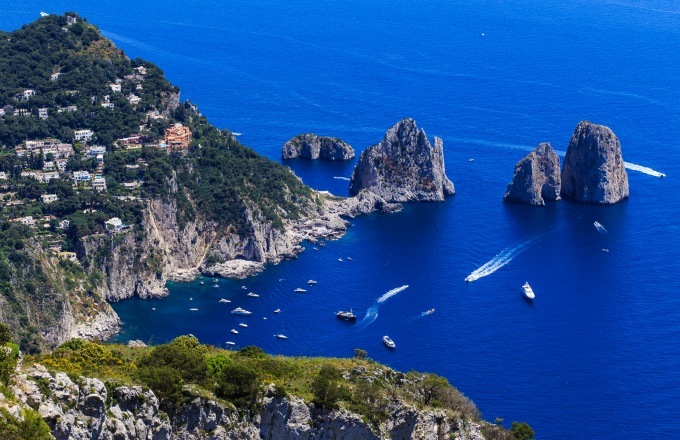 The next day, cruise by hydrofoil to the island paradise of Capri. In the afternoon, meet a local mozzarella producer and learn how the cheese is made, before enjoying a home-cooked meal at their farm. This morning, travel north to Rome, stopping en route in the ancient city of Pompeii, which was buried in volcanic ash and frozen in time when Mount Vesuvius erupted in AD 79. This evening in Rome’s Trastevere, join a welcoming local at her home for wine and a home-cooked feast. Journey through history the next day with a morning visit to the Imperial Roman Forum and the Colosseum; in the afternoon, explore the charming Campo de Fiori, the Piazza Navona and its remarkable Fountain of the Four Rivers, and the Pantheon, one of the most widely copied buildings in the Western world. Later, stop at the iconic Trevi Fountain before taking in the Spanish Steps. On your third day, explore Vatican City, where you view the Sistine Chapel with its legendary frescoes by Michelangelo, as well as St. Peter’s Basilica. Continue north to the famed region of Tuscany, stopping en route in medieval Siena. Here, your local expert introduces you to the Piazza del Campo, home of the famous Palio di Siena horse race. Continue to Florence, a vast and beautiful monument to the Renaissance. The next day, in the company of a specialist art guide, visit the Galleria dell’Accademia to see Michelangelo’s David and the Uffizi Gallery, home to some of the world’s most important art treasures. Later, cross the Ponte Vecchio to stroll the delightful Boboli Gardens on the grounds of the Pitti Palace. On your last day, savor the sights of the Mercato Centrale market before enjoying a three-hour culinary class, where your chef shares the secrets of Florentine cooking. Drive to Pisa, where you see the extraordinary Leaning Tower and explore the Pisa Cathedral and Baptistery with a local guide. Stop in Lucca to tour its lovely pedestrian quarter, then continue on to your next destination, the stunning Italian Riviera. Discover the extraordinary beauty of the Cinque Terre (“Five Lands”), five scenic villages built along the steep coastal cliffs of Liguria on the Italian Riviera. See Manarola, a fishing village set amid terraced vineyards where you can walk to view the coast, and visit other villages nearby. Travelling by coach to Venice, stop en route to enjoy a private tasting of balsamic vinegar. Then visit Verona, known to the world as the setting for Romeo and Juliet. In Venice the next day, visit St. Mark’s Basilica, with its lavish decoration of marbles and golden mosaics, and the Doge’s Palace. By special arrangement, spend time at a workshop famous for crafting Venetian carnival masks, taking part in a class where you create your own to bring home. This evening, gather for a festive farewell dinner. Transfer to the airport the next day for your flight home. Save $500 per person when you book by March 31, 2016. A&K provides porterage of two (2) pieces of baggage per person. Please note should your journey include internal/ domestic or charter flights your luggage allowance may be less than two (2) pieces of baggage and weight/size restrictions may apply. Details will be provided in your Pre-Travel Documentation. Baggage and personal effects are at the owner's risk throughout the travel program, and A&K assumes no liability for lost or damaged baggage. Please check with your international carrier for other baggage restrictions and fees applicable to your international flights. The minimum age is 10 years old unless noted on the itinerary and all children under age 18 must be accompanied by an adult. Minimum age is 12 years old for Connections European River Cruise Journeys and varies for Family Journeys. Some activities contained within an itinerary may have a different age restriction than the overall minimum age requirement. Details will be provided at the time of booking. A&K reserves the right to marginally exceed the published maximum group size on Family journeys to accommodate a family.